Looking to break out of the same old routine for dinner? 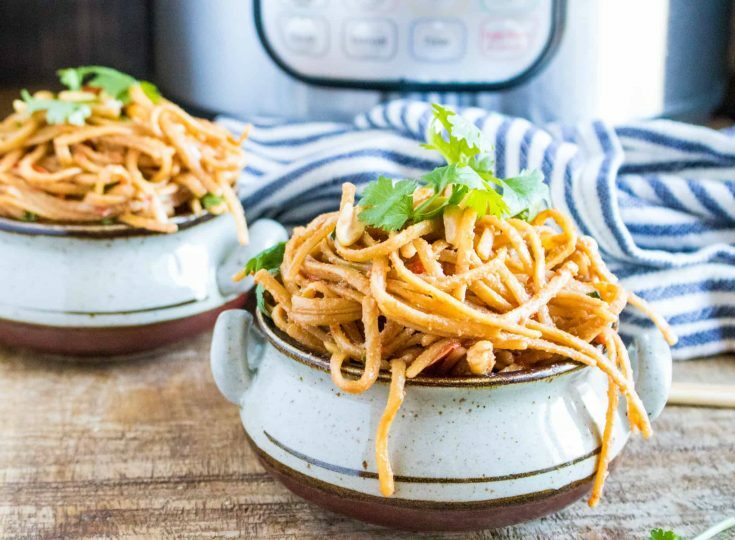 Instant Pot Thai Peanut Noodles is just what you’ve been looking for! This recipe is quick, easy and absolutely delicious. This one-pot recipe is so quick and easy to make! Simply mix all ingredients together in the Instant Pot, and then cook on high for 4 minutes. You’ll be sitting down to eat in under 15 minutes! These noodles have just the right amount of flavor, and are not spicy. But if you prefer spicy, you can easily adjust the heat with the addition of Sriracha sauce. It’s high in protein. The addition of peanut butter to this recipe gives each serving 21.5 grams of protein. 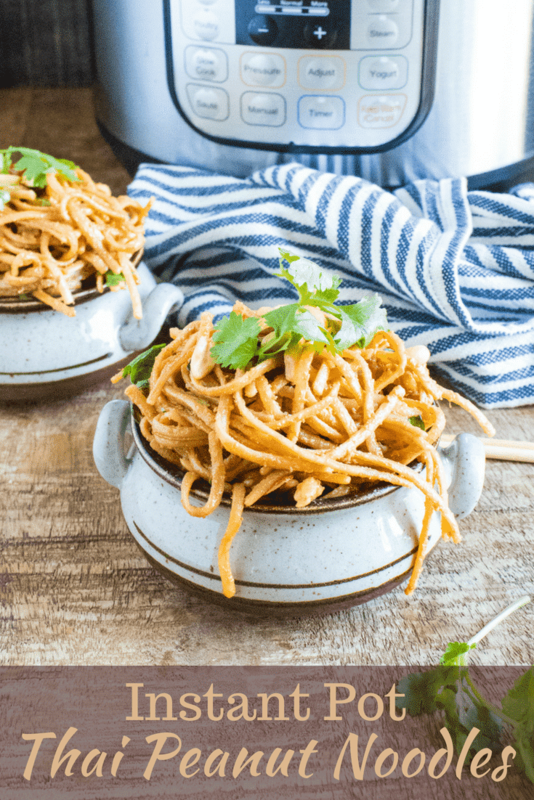 Are Instant Pot Thai Peanut Noodles Gluten Free? The recipe as written is not gluten free, but with a few simple substitutions you can make this dish gluten free. The spaghetti noodles and soy sauce are the two ingredients that contain gluten. 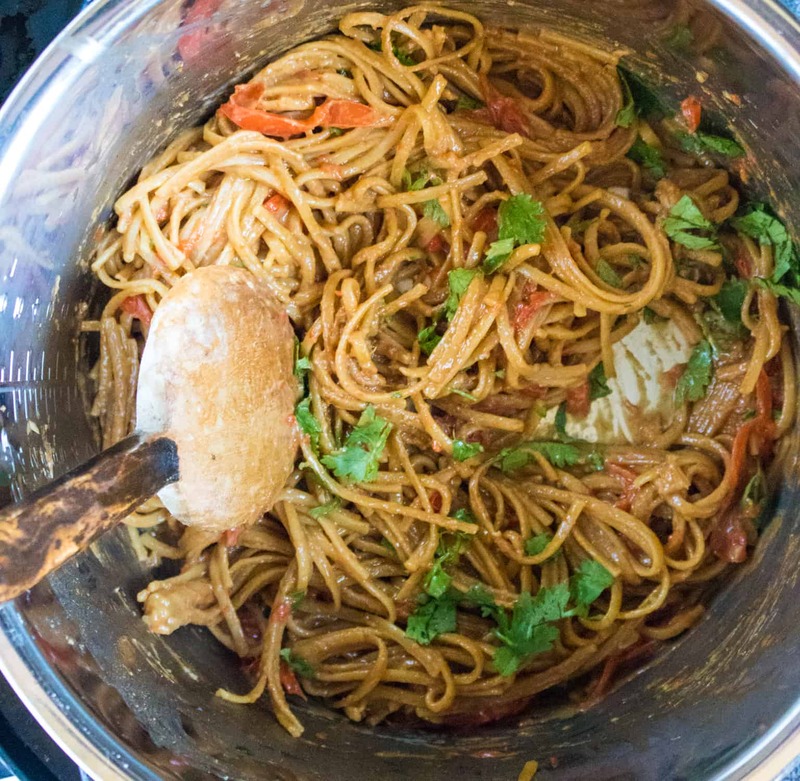 The spaghetti noodles can be swapped for rice noodles (or any other gluten-free pasta), and you can replace traditional soy sauce with Tamari which is a wheat-free soy sauce. Tamari has a darker color and richer flavor than the common soy sauce you may be more familiar with. It also tastes more balanced and less salty, so it may be a desirable substitution for those who are not sensitive to gluten. 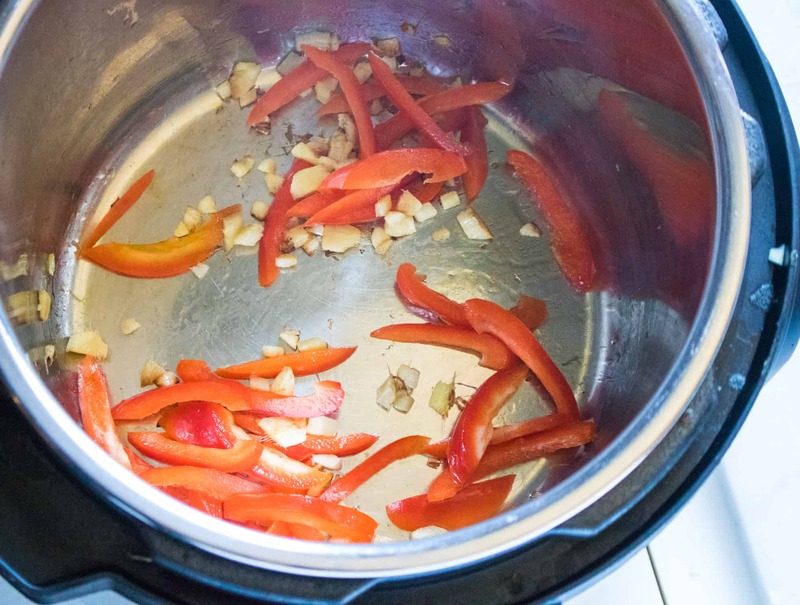 Step #1: Turn the Instant Pot on to sauté and add sesame oil, ginger, garlic and sliced peppers. Stir ingredients while on sauté mode for 1-2 minutes. Step #2: Mix together honey, peanut butter, soy sauce, chicken broth and rice vinegar. Add to Instant Pot. Step #3: Break noodles in half and add to the pot, pushing them down to until they are covered by liquid. Step #4: Turn pressure valve to sealing and set manual pressure on high for 4 minutes. Step #5: Do a quick release when the pressure cooking time has elapsed. Instant Pot Chicken Curry—Coconut milk and curry are center stage flavors in the recipe; the flavors meld together perfectly to make the best chicken curry you’ve ever had! Instant Pot Philly Cheesesteak—Provolone cheese, sliced beef , sautéed peppers and onions served in a hoagie. A classic Philadelphia sandwich that you can make and enjoy at home. Instant Pot Cajun Sausage and Rice—Rich and yummy this Cajun Sausage and Rice recipe is delicious and hits all the right flavor notes without being too spicy. 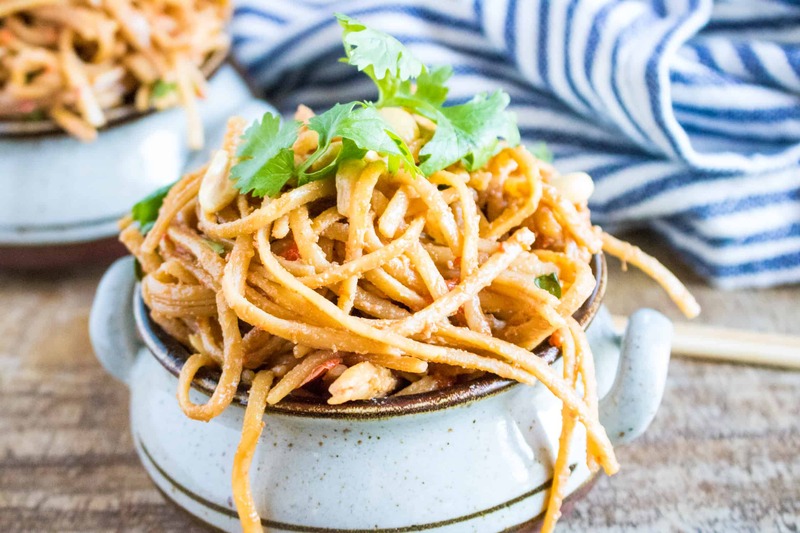 Instant Pot Thai Peanut Noodles is a quick and easy meal you'll love! 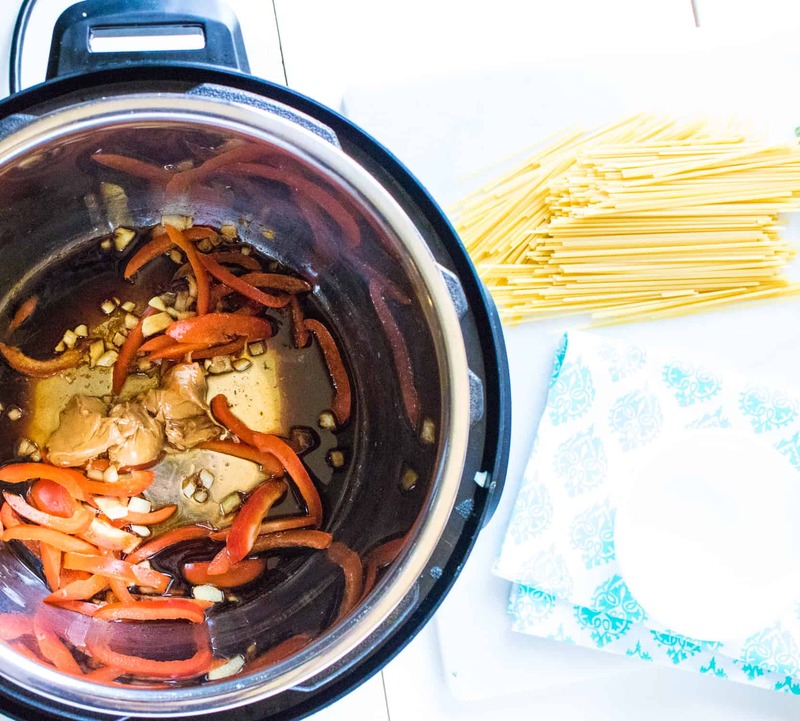 Turn the Instant Pot on to sauté and add sesame oil, ginger, garlic and sliced peppers. Stir ingredients while on sauté mode for 1-2 minutes. Mix together honey, peanut butter, soy sauce, chicken broth and rice vinegar. Add to Instant Pot. Break noodles in half and add to the pot, pushing them down to until they are covered by liquid. Turn pressure valve to sealing and set manual pressure on high for 4 minutes. Do a quick release when the pressure cooking time has elapsed.